Spammers are the source of a flood of messages that appear to originate from various social networks, including Facebook and Myspace, as well as popular sites like iTunes. The spam messages usually just contain a link, and possibly a few words. Their subject matter falls into three general categories common to most contemporary spam: Pill vendors, Russian bride “vendors,” and drive-by download sites hosting Zbot password-stealer installers. It’s not unusual for spammers to forge the return addresses, but the sheer volume of spam that has been forged so it appears to originate from MySpace, Facebook, or iTunes is notable. Today is Data Privacy Day, which is supposed to remind us all that keeping our digital secrets a secret is important and necessary. To commemorate the event, I’d like to run down some of the most serious privacy threats any of us could face on a daily basis: How a malware infection puts your privacy at risk. For years, it’s been clear that the creators and distributors of malicious software are after one thing above all others — money. Whether they steal it (by installing a keylogger, or just phishing) or defraud you out of it (by coercing users to pay good money for a useless security application, or holding your computer itself hostage) cash is the name of the game. But this isn’t pickpocketry — they’re not literally taking money out of your wallet. 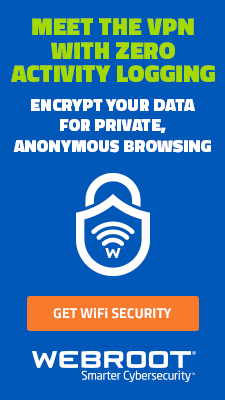 Somewhere along the way, the Bad Guys are using your private information to do that. Here are just a few ways they accomplish this task, by hook or crook. And more importantly, some tips that you can use to put a crimp in their plans. Searchers beware: Those photos of celebrities or funny cat pictures that turn up in your Google image search results might not be photos at all, but fake antivirus alerts. Evidence appears to indicate that a similar scam to one we blogged about last November may be working its way up the Google food chain into other forms of search results. Throughout the day we’ve been looking for links such as these; Each malicious URL we found funnels the browser into the same fakealert, which itself leads to the same rogue antivirus product. Each time we revisited the site, we ended up with what was essentially the same equally nasty rogue antivirus application, sometimes in a different skin, sometimes with a different name. Early in the day we were pulling down something called Total Security. By the afternoon, the tool’s name had morphed to become Security Tool. The rogue’s behavior on an infected system is obnoxious in the extreme. It hides the desktop by covering everything over with its own wallpaper, and blocks your ability to right-click the desktop, so it’s more difficult to revert the desktop’s appearance by changing your Display Properties settings. It also disables the scroll wheel on the mouse, then blames that behavior on a massive infection it claims has taken over your PC. It prohibits most Internet-capable applications, or even tools like the Task Manager, from running, in the guise of its “firewall” component. Of course, it’s all smoke and mirrors, an attempt to convince you to spend from $50 to $90 on completely ineffective, utterly useless former-Soviet snake oil. 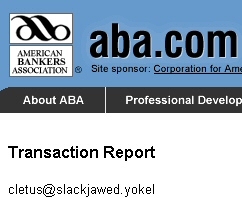 As the reign of nuisance by Trojan-Backdoor-Zbot continues, the latest scam invites victims to review a “transaction report” on a page supposedly on the Web site of the American Bankers Association, or ABA. The “report” is, of course, an installer for this Trojan. The scam is virtually identical to ones we’ve seen where the scammer sets up Web sites in the guise of such notable organizations as the IRS, CDC, Visa, and other organizations, or software programs like AOL Instant Messenger and Microsoft Outlook, or Web sites such as Facebook. 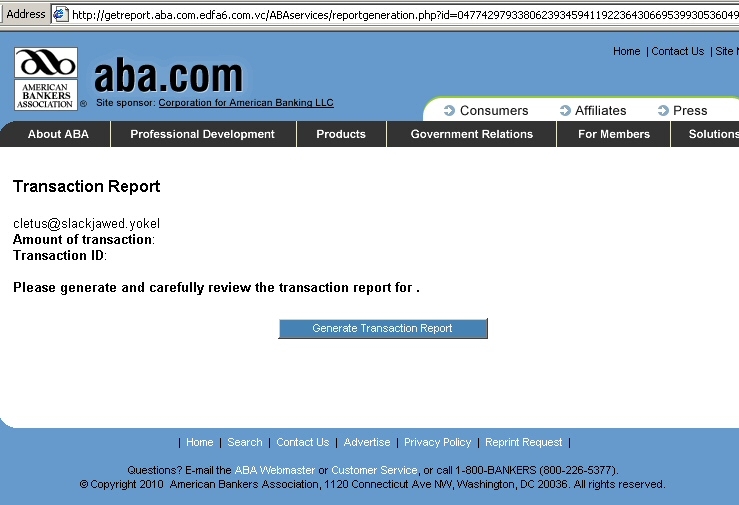 As in the previous scams of this ilk, the URL that victims click includes the victim’s email address; That email address appears within the fake page, along with a bogus transaction ID and an outrageously large Amount of transaction — all information that’s designed to inspire a sense of panic and urgency in the victim, leading the victim to click the “generate transaction” link on the page and infect a computer with the Trojan. A payload file installed along with some variants of the rogue Internet Security 2010 “antivirus” program modifies victims’ networking settings within Windows, inserting itself into the network stack and preventing victims from visiting some of the Web’s most popular Web sites. More than 40 sites have been targeted, including: Microsoft’s live.com and Bing search engine; social networking giants Facebook, Twitter, MySpace, Bebo, LinkedIn, and YouTube; news organizations including Fox News, The New York Times, the Washington Post, and the UK’s Guardian and BBC news sites; and blogs hosted by blogger.com, livejournal.com, and wordpress.com. We’ve seen an increase in the number of spies that bollix the LSP chain lately. In cases where this happens, if you simply remove the malicious file that is referenced in the LSP, the computer remains unable to connect to the Internet afterwards. To fully repair the PC, you’ll need to fix that broken chain. Fortunately, the fix for this spy — which we’re calling Trojan-Annoyinator — is fairly easy. 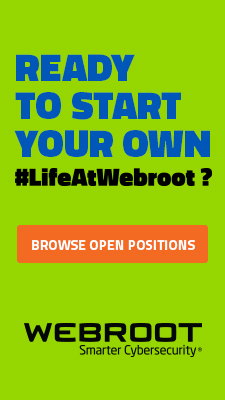 Users of Webroot’s products can simply sweep, and the spy along with its LSP modifications will be removed upon reboot. If you don’t have one of Webroot’s antimalware product installed, you can go through the process manually, which isn’t difficult for someone familiar with Windows tools such as Regedit. The only problem might be getting to Microsoft’s Web site (where the instructions are posted) from an infected computer. 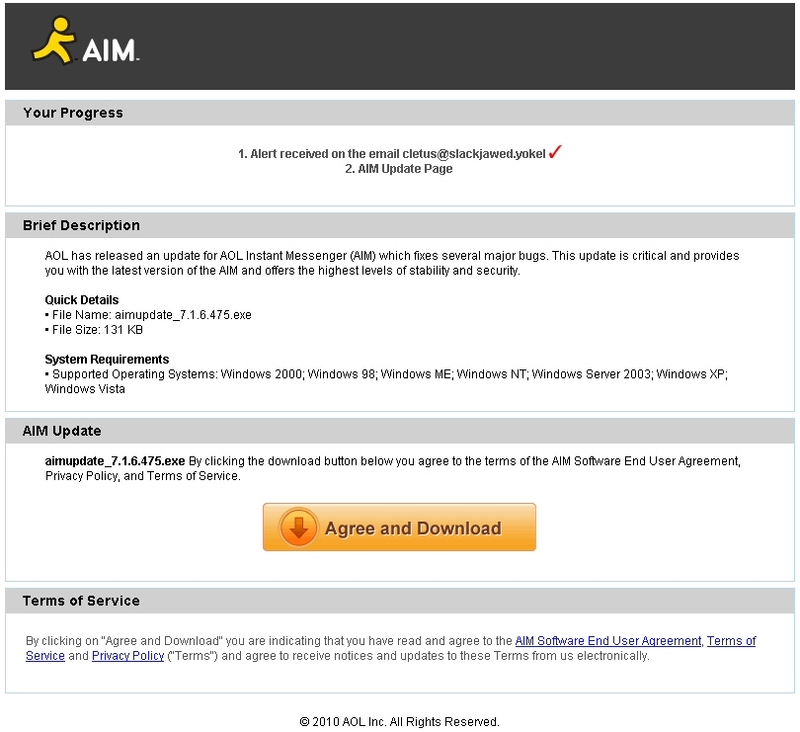 The Zbot keylogger campaign-of-the-month targets users of AOL Instant Messenger (AIM) with a message that claims to be an update notification for users of the instant messaging client application. 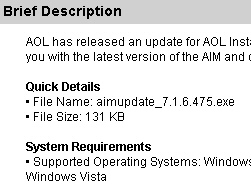 Users unfortunate enough to click through the link in the email message to download what they think is something called “aimupdate_7.1.6.475.exe” will be in for a rude awakening. The malicious page delivers its payload whether or not a victim clicks the link to get executable file: It opens an iframe to a site that attempts to use vulnerable versions of Adobe Reader to push the Zbot keylogger down to the victim’s computer, then execute it, within a few moments of the page loading. The address of the iframed page resides in a particularly sketchy corner of the net. The network the IP address is part of, known as AS50369, goes by the name VISHCLUB-as Kanyovskiy Andriy Yuriyovich. Sure sounds a lot like someone’s name for their phishing gang. The same network has been in use for the past week delivering payloads on well-worn Outlook Web Access and HMRC Zbot download pages. Seriously, though: Vishclub? Is that the best the Russian hackers can come up with? It sounds like what you’d call a fisherman’s smoking lounge on the Baltic coast, where thick clouds of cheap tobacco is the only thing that can overpower the putrid stench of rotting seafood. The fake page has the outward appearance of a page hosted by AOL, but it clearly isn’t the real deal. Once you take a closer look, the site and its social engineering tricks begin to smell a bit like day-old fishwrap, as well. A new variant of the Koobface social networking worm is sending social networkers links that lead to fake videos supposedly posted by the beloved cartoon antihero Spongebob Squarepants. The fake videos only display a popup message labeled “Adobe Flash Player Update” that says “This content requires Adobe Flash Player 10.37. Would you like to install it now?” Clicking anywhere on the page downloads the Koobface installer to the victim’s PC. In other ways, the worm features a few small tweaks: Its Captcha tool, which attempts to convince infected users to enter the text of a captcha into a dialog box, has been modified to read and properly display the new ReCaptcha format used by some social network sites. The new format randomly places black circles ‘behind’ the text, and inverts the text of the captcha phrase where the text and black circles intersect. While we’ve touched on the subject of World of Warcraft phishers (and the Trojans they attempt to spread) a handful of times in the past several months, it’s worth mentioning the ongoing problems phishing posts cause both players and Blizzard, the game’s operator. To recap, the official message board for World of Warcraft is under constant attack by phishers, who use stolen credentials to post message board articles containing malicious links under the names of the innocent players whose passwords have been stolen. 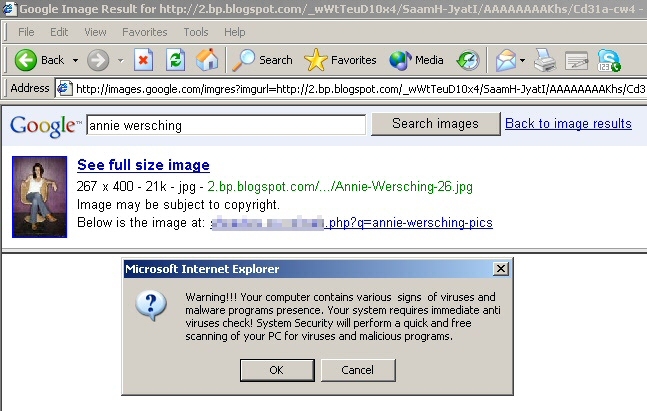 The links, which can be tied to virtually any kind of social engineering tease, typically point to Web sites that contain scripting code which either pushes a WoW-credential-stealing keylogger down to the victim’s computer, or aggressively “suggests” that the victim should download and install some purportedly missing component (often, a fake Flash player update) that does the same thing. The authors who plague the forums, in-game chat and email with these posts containing malicious links are a crew of dimwits, but they aren’t so thick that they fail to recognize an opportunity when they see it. Beginning in early December, for instance, they took full advantage of the incredibly busy state of the official forums, which were filled with posts tied to the release of a highly anticipated update to the game, and rumors about “beta testing” access to the update. The heavier-than-normal traffic kept forum moderators busier, and subsequently the phishing posts remained active on the forums much longer before administrators deleted them. A longer exposure time means it’s more likely that victims will click through the malicious links, and with the customer support staff busy solving patch-related issues, compromised accounts remain compromised — keeping paying players locked out of the game — for even longer than they normally would. The problems have become so overwhelming that even Blizzard itself has been forced to acknowledge the scale of the problem. Spammers hawking “fun videos” have been worming their way into Google Groups, the global message board Google built on the skeleton of the old Usenet network. Only, the pages the spammers point victims to, which don’t actually contain videos, come with a nasty surprise: Rogue antivirus apps. The attacks began late last year, but have been increasing in frequency through the holidays, and haven’t abated in the new year. The users sending out the spam messages all use free Gmail accounts (one even named his spam account Santa Claus), and have been requesting access to both open-membership and closed-membership Groups, the latter of which require an administrator’s approval. Once added to a group’s member list, the spam accounts post brief messages (an example shown at left) with a link. 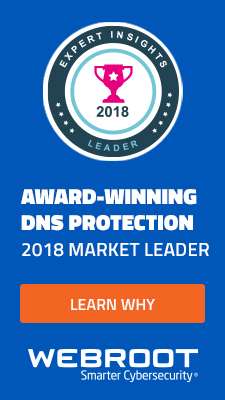 The URLs originate from a number of link-shortening services, but they all work the same way: Each shortened link points to a different, unique subdomain of the Utah-based free Web hosting service 150m.com. Those pages contain a single line of code which redirects the browser to one of several servers with Chinese domain names. Those servers, in turn, redirect the browser to the website hosting the rogue antivirus installer. The shortlinks and Chinese websites only remain viable for a day or two, at most. It’s not clear whether the past year will go down in history as a particularly bad year for malware, but one thing is certain: It was bad enough, at times, that fighting infections and cleaning PCs took priority over virtually all other work. Neither home users nor businesses were immune from wave after wave of increasingly nasty malware tricks, though there were a few bright spots: A fix issued by Microsoft mid-year meant that worms are far less likely to be able to spread using portable storage like thumbdrives or digital photo frames; A corresponding dropoff in overall worm detections has borne out the effectiveness of that update. And the social engineering tricks employed by malware gangs are, at least for the moment, repetitive enough that they’ve become fairly easy to identify. What follows is Webroot’s list of the five most egregious examples of malicious software that, even if some of them didn’t initially appear in 2009, progressed to serious threats throughout the past year. Also ringing in the new year with 2009, the Koobface worm has now become the most serious threat facing users of social networks. Initially targeting users of Facebook, the worm — actually a complex, well-coordinated combination of malicious applications, each of which is designed to carry out specific tasks — continues to circulate within more than a dozen social networks. Koobface also brought to the fore the utility of social engineering (through PT Barnum-esque trickery) as a means for malware to propagate itself, not just infect an initial victim’s PC. Koobface almost represents its own branch on the family tree of malware, a malicious organism that can be used to distribute any number of undesirable files to an infected computer. The success of Koobface, and its continued development and improvement throughout 2009, shows no sign of abating into next year. With Koobface highlighting the effectiveness of social engineering, others have joined the bandwagon. The second half of 2009 showed how trickery could lead to infections even with keyloggers as mature as Zbot, which has been seen in the wild in various forms since 2006. 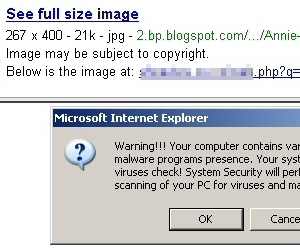 However, 2009 saw Zbot infections on the rise, as one or more malware gangs crafted coordinated spam campaigns that fooled recipients into believing that the messages’ legitimate origin were banks, or government organizations (both in the US and elsewhere), trade groups, or financial institutions, or even Microsoft itself. The A-list organizations spoofed by these campaigns read like a Fortune 100 who’s who list: Visa International, the IRS (and its UK counterpart the HMRC), DHL, FedEx, Chase, Bank of America, the US Postal Service, and the Federal Deposit Insurance Corporation, just to name a few. These spam messages, leading to fairly sophisticated fake Web pages, were put together with one goal in mind: To convince potential victims to download and execute the Trojan horse installer themselves. These campaigns show no sign of letup, and it’s not hard to foresee more of the same continuing into 2010. Do you use a social networking site? Be prepared, because I predict in 2010 it’ll be a major target for cyber criminals. 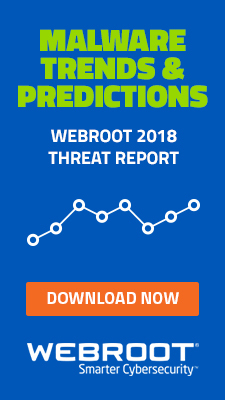 Among the threat experts here at Webroot, we’ve discussed the ROI opportunity that social networks present an enterprising hacker who strings together the personal information people choose to share on social networks, or who creates a program to infect PCs with one click of a malicious link. I’ve also discussed the issue with my colleagues in the security industry. Each of us acknowledges that users of all kinds – be it individuals, public figures, nonprofits, or corporations – assume a certain level of risk when signing on to one. But we all agree social networks are pretty much essential in today’s networked society and economy. 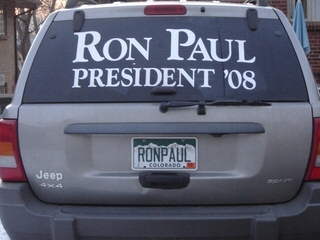 Here’s a mind-bender for you to ponder over the holidays: What do diva musician Beyonce, the massively-multiplayer game World of Warcraft, the anime series Naruto, and Libertarian politician (and failed presidential candidate) Ron Paul have in common? I couldn’t guess what you might come up with, but we’ve found a drive-by download attack that delivers malware, using these disparate icons as a hook to convince Web surfers to click malicious links. The hack attempt was discovered by a Threat Research Analyst who also happens to be a Ron Paul fanatic (and I do mean fanatic — that’s a photo of his truck parked out back). While doing his daily search for Ron’s latest words of wisdom, he encountered a cleverly crafted campaign to manipulate search results which originated with Twitter feeds suddenly lighting up with links supposedly pointing to YouTube videos. A large number of Twitter accounts tweeted messages like “YOUTUBE RON PAUL – BEST NEW VIDEO – WATCH NOW” or “YOUTUBE NARUTO CHAT ROOM 1 | BEST NEW VIDEO | WATCH NOW” — you get the idea — all within a short amount of time. 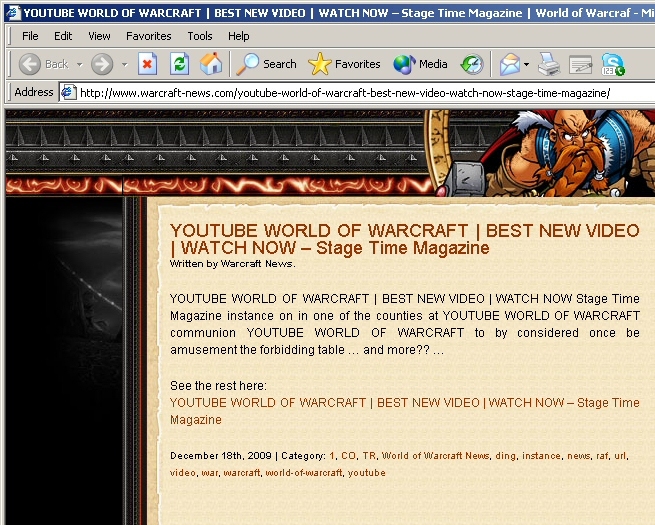 Each of those screaming teasers was accompanied by a URL shortened using the bit.ly (and to a lesser extent, TinyURL.com) service; The bit.ly URLs pointed to a (now deleted) hidden subdirectory on the website of Stage Time magazine, an online only, stand-up-comedy industry publication (neither YouTube nor Stage Time was, knowingly, involved in the hack — they were victims as well). And the many first-time visitors to that site found their computers in a world of hurt shortly after following one or another of those links. The malicious pages on Stage Time hosted PHP scripts that pushed down several new malware samples; The scripts exploited security vulnerabilities in older versions of Adobe Flash and Adobe Reader, loading maliciously crafted SWF and PDF files in order to force the browser to pull down and run malicious executables which had virtually no detection across the spectrum of antivirus vendors. Some of these samples were droppers, others were downloaders; In either case, the drive-by payloads left the PC in a very bad state.